You know the drill. Yout cut out everything you live. Count calories (or points). Obsess over everything you put in your mouth. Feel deprived. Hungry. Blow up at the kids and your husband because you’re miserable. And then 3 days in, you throw in the towel. I help chronic dieters break up with the pain of dieting and healthy, sustainable results by embracing a mindful approach to eating. I’ve been where you are. I’ve counted calories (and points), I’ve measured my food, and drank my meals. I’ve worked for hours on end and that only lead me to hating exercise. I know what it’s like to feel like I’ve tried every fad diet out there and not seeing the results I was hoping (and praying) for. I believe that health isn’t defined by the number on the scale or the size of our jeans. There’s so much more to health than that. We know that dieting and weight cycling lead to a higher weight and inflammation. 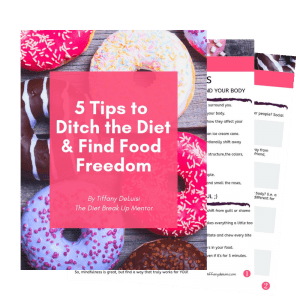 You’re health and wellness can be improved and doesn’t include deprivation and feeling like we’d rather eat dirt than continue another day on another dreadful diet. I believe that most disease is treatable and preventable through proper nutrition and lifestyle change (including reducing stress and getting more sleep). I believe there no “one size fits all” approach to getting healthy. It’s about feeling comfortable in your skin without taking extreme unhealthy measures while reclaiming your energy and vitality. I am a mom of 2 boys (8 and 4). I have a BS degree in Education and spent 8 years teaching 3rd and 4th graders before I became a full-time mom. 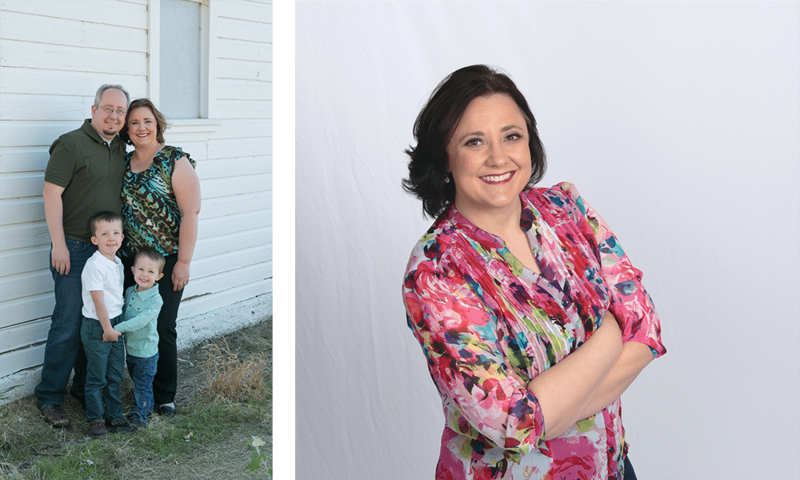 My own weight loss journey lead me to becoming a Certified Health Coach through the Health Coach Institute because I wanted to help other women ditch the diets and lose weight in a healthy, sustainable way. In early 2017, I was diagnosed with fibromyalgia and wanted to learn how to treat my symptoms in a holistic way. 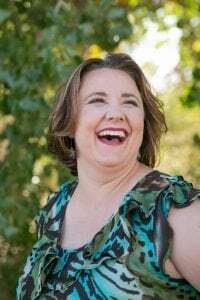 I then got certified as an Gut Health Specialist from the Institute of Transformational Nutrition and certified as an Essential Oil and Herbal Specialist from AADP (American Association of Drug-less Practitioners) . I love to learn and am constantly looking for more ways in which I can be of service to my clients. 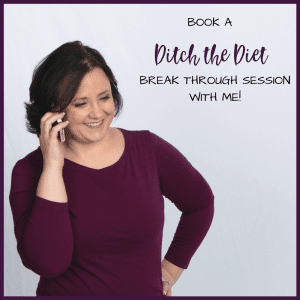 I call myself the Diet Break Mentor and my goal is to help you reconnect with your internal body cues, build back body trust, and cultivate a healthy and peaceful relationship with both food and your body. 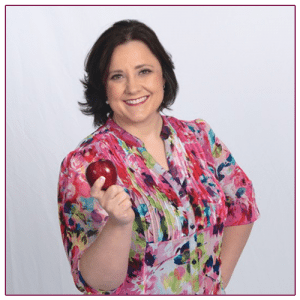 With this approach, you will discover the nutrition and self-care behaviors that will help you to nourish yourself and to thrive – for the long run. As someone with autoimmune, I understand that I have to eat in a way that supports my body. That’s what makes me unique. I can help you become an Intuitive Eater but also help you navigate how nutrition can help you and your overall health. When I say I’m Anti-Diet, what I AM talking about are diets that are an externally focused way of eating, where food decisions are made based upon an outside source rather than your own body’s internal cues and where the goal or intention is to manipulate body size or appearance. Intuitive eating is about giving yourself permission to have all sorts of foods, but it doesn’t mean you actually always eat them (i.e. food allergies and sensitivities). But making peace with food and giving yourself unconditional permission to eat allows to to get to a point where you can make food decisions from a place of self-care, rather than from a place of deprivation or restriction. It’s time to eat the delicious, wholesome food your body was designed to eat –it’s not about dieting and restriction. It’s about learning how to listen to the secrets your body is telling you every day. Just like exercise, this doesn’t have to feel like a punishment. More than healed helps you find the personalized nutritional balance that is best for you, both in terms of fueling your body and satisfying your soul, because let’s face it, so much of food is emotional and cultural. Of course you know the many benefits of (reduced stress, better sleep, improved mood, etc. ), but sometimes it’s hard, or nearly impossible, to make it happen. Maybe it seems like a chore, maybe you’re far too busy, maybe it’s something else or a combination. Whatever the reason, we help you find ways to be active, at your own ability, that are both beneficial to your physical health and enjoyable for your soul. If that’s not enough already, we provide you with the tools to actually follow through regularly and long-term. We are told that a certain weight is “healthy.” However, for a lot of people, the weight we are told is “healthy” is not healthy or sustainable at all. Getting to that weight will require a lot of disordered and unhealthy behaviors, and only result in your weight cycling back up to protect you. In turn, you feel defeated for not being able to reach your goal weight, and the health-promoting behaviors you adopted for the intent of weight loss are viewed as useless. The behaviors go out the window. Whenever the goal is weight loss, there will be restriction. When you stop focusing on your weight and instead start focusing on your health, you’ll not only have a much better relationship with foods and your body, but you’ll also improve your health overall. Health and well-being are possible no matter what the person’s size. What I have found is that most people have a pretty good idea of what they need to do to lose weight, but for one reason or another, they just aren’t doing it or can’t stick with it. When you have a private health coach, you are no longer on this journey alone. You will have someone who will truly listen to what you want and to the struggles you face. You will have someone who is just as committed to you becoming an intuitive eater, improving your health, and feeling amazing in your body just as you are. And you will have someone who will help you be accountable to the goals you set for yourself. Health coaching is a highly personalized and tailor-made experience because every person has their own unique set of goals, challenges, obstacles, and strengths. So rest assured, you will not be expected to follow a rigid set of rules and guidelines that won’t fit into your life or get you the results you want. In short, as your personal health coach, I am committed to your success and will offer you support, guidance, encouragement, and accountability so that you can change your relationship with food and say good-bye to diets once and for all.